The child energy seeks parental energy… And yet we tend to “personalise” parental energy, and therefore limit it’s origin to our parents and carers. So if the flow of parental energy through these fine people is shaped in a way that didn’t connect with our various child energies, an unmet need is generated which becomes a deep and unfulfilled longing. Our proclivity to personalise the source of our fulfillment generally puts us on a path that seeks for it directly from them. Or, as we move through life, from surrogates like spouses or even our own children. Sometimes there’s a blessing, and through another the need is met, is able to be fully received and the spirit moves forward. But for the most part the seeking patterns we adopt, the unresourcefulness of those we beseech or the sadly inadequate communication skills of either party leaves the longing unmet. Our frustration and sense of failure adds insult to injury. Confused and with no alternative we soldier on, deeper into unfulfilling territory. The good news is: If you parent yourself in all the ways you wish you had been parented, then Love will run amok in your heart, where need once did. Through the notion of self-parenting I was liberated from my personal history and then discovered some GREAT news! Parental energy is non-personal and can joyfully flow through you to your child energies in exquisitely precise ways. One way is with an NPA tool that is taught at The NPA Expansive Weekend and I use a lot in my sessions called the ‘Parental Integration Frame’. In an elegant and easy way it allows me to elicit your hidden perspective on what needs to happen (in the parental energies) in order to create the ideal parental conditions. Then you can discover and access what’s been truly longed for but never fulfilled. Using NPA we then work to balance and shift the parental energies to meet those conditions, allowing the longing to be experienced and fully received. Although this process is simple and quick (It takes less than half an hour) it can be highly emotional and has a huge impact on people’s lives. The process doesn’t ask you to get into the historical story of what should or shouldn’t have happened, it cuts straight to core of what truly matters to you, as the child of somebody; then, now and always. Our parental energies, in many ways, are the foundation of our wellbeing. It took me a lot of journaling, crying, story telling, blaming, journey processing and relationship breaking before it dawned on me that I could parent myself. Coming up with a simple way to share that has just been the icing on the cake. The Parental Integration Frame doesn’t require you to figure out what conditions are required to allow your longing to land in you. It uses a simple technique to bypass the analytical mind which, I have found, makes for a vastly accelerated healing. Nonetheless I began self-parenting even before I created the Integration Frame and so I want to leave you with an inquiry – something to sit with and help you down the road of self-parenting. I’d love to hear your answers in the comments below and, of course, any questions. 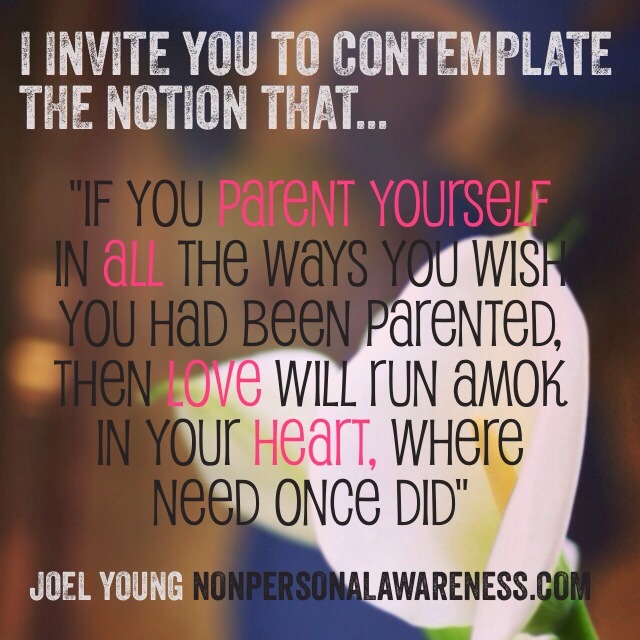 Joel Young, Father & Mother of Himself and Originator of NPA. Because you’ve shared this post I want to offer you something that I’m not offering anywhere else! I’m willing to take you through the NPA Parental Integration Frame, in a 30 minute (max) 1:1 session. In this highly focused session with me, I will walk you through an NPA Parental Integration Frame to balance your parental ‘energies’ and unleash your inner childs essential relational longing. All in a little under 30 minutes! Click HERE to say Yes please! I’d really value taking half an hour to bring balance to the parental energies I’ve been living with. And I would love to allow the child energies within to finally receive the essence of what’s been longed for, for just £79. Tagged acknowledgement, child, communication, confused, consciousness, core, energy, father, flow, inner child, inquiry, integration, Love, mother, need, non-personal, parents, personal history, process, protection, relationship, relationships, self-healing, understanding, wellbeing. « Which Of These Qualities Would You Most Like To Experience More Fully? Yesterday at an acupuncture and massage session with my chinese doctor I noticed feelings of being very scared in my body. So my answer to your question today is My inner child needs safety. Which surprises me. I have been working as a crisis psychologist going into very bad situations like car accidents, school shootings and helping survivores to cope and live on. Aiming to bring safety into chaotic situations. How might I give that to myself and not only to others? * This chinese massage is good – the doctor´s verbal communication is very scarce as she knows very little Finnish and English. She talks with me through her hands. my passion has been continuum movement by Emilie Conrad, there we are interested of a fluid movement in our bodies .Now I ve come to know some of npa that is to me the fluendity of thoughts and feelings. Yes, this inner child . I saw myself as little girl in a green forest ,alone and fully and unconditionally loved . So to be really loved however I am and no matter wheather I choose to be alone or with other people, there is always a connection, a field a field that is vety safe and loving kind. Parenting my self is a very good way to see it.